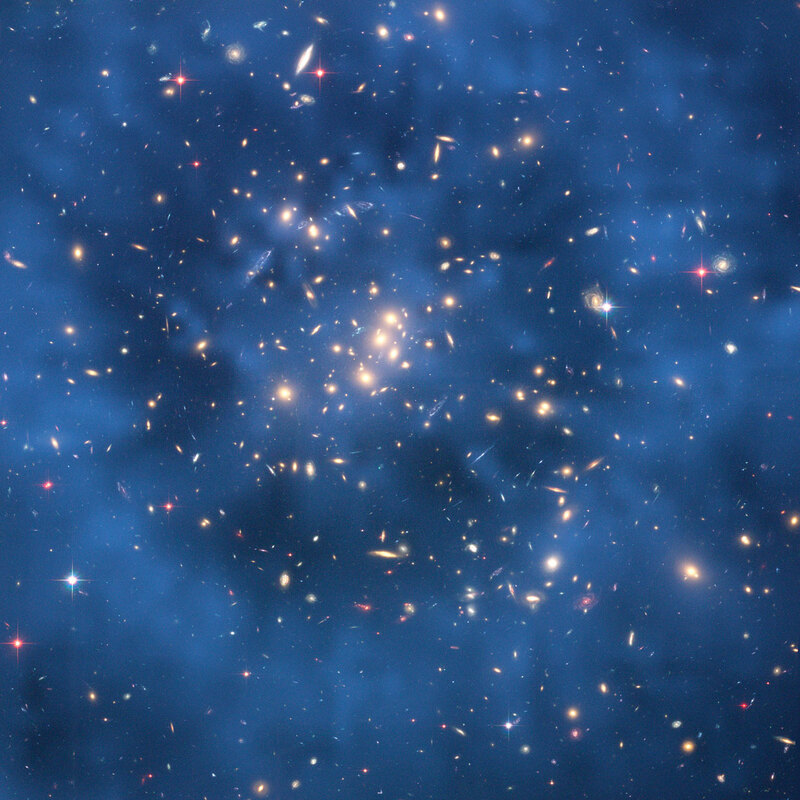 Gravity reveals the existence of large amounts of dark matter in the Universe. The present acceleration of the expansion of the Universe points to the existence of an equally mysterious dark energy. The true nature of each remains unknown. 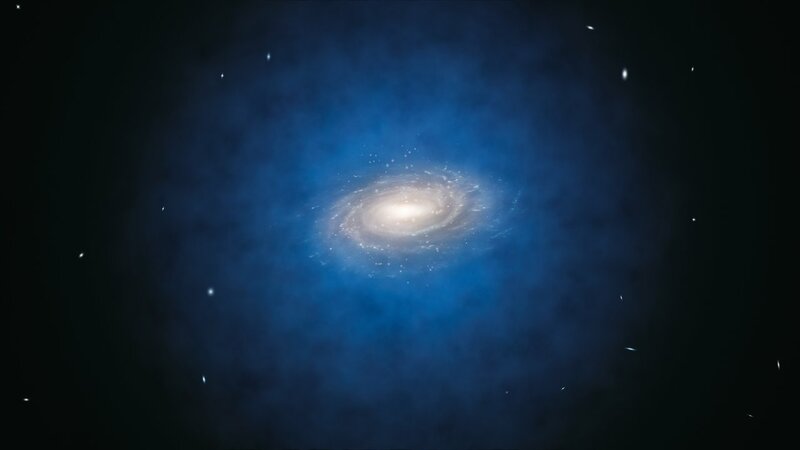 Matter map: Studying how the gravity of a foreground cluster of galaxies distorts images of background galaxies makes it possible to map the distribution of dark matter. Dark halo: Our Milky Way galaxy is embedded in a huge halo of mysterious dark matter, depicted in blue in this artist’s impression. Keep searching: Particle experiments, like CERN’s Large Hadron Collider (seen in cross-section here) are searching for dark matter particles, but have not found anything yet. In the 1970s, it became evident that galaxies contain large amounts of dark matter, causing their outer regions to rotate much faster than expected. Astronomers now believe that 85% of all matter in the Universe is dark and consists of as-yet-unknown particles. In 1998, two independent teams of astronomers also discovered that the expansion of the Universe is accelerating – apparently, empty space contains a mysterious form of dark energy. Together, dark matter and dark energy account for 95% of the matter/ energy density of the current Universe. Only 5% of the matter and energy of the Universe consists of ordinary matter, i.e. the kind of matter we can see and touch. 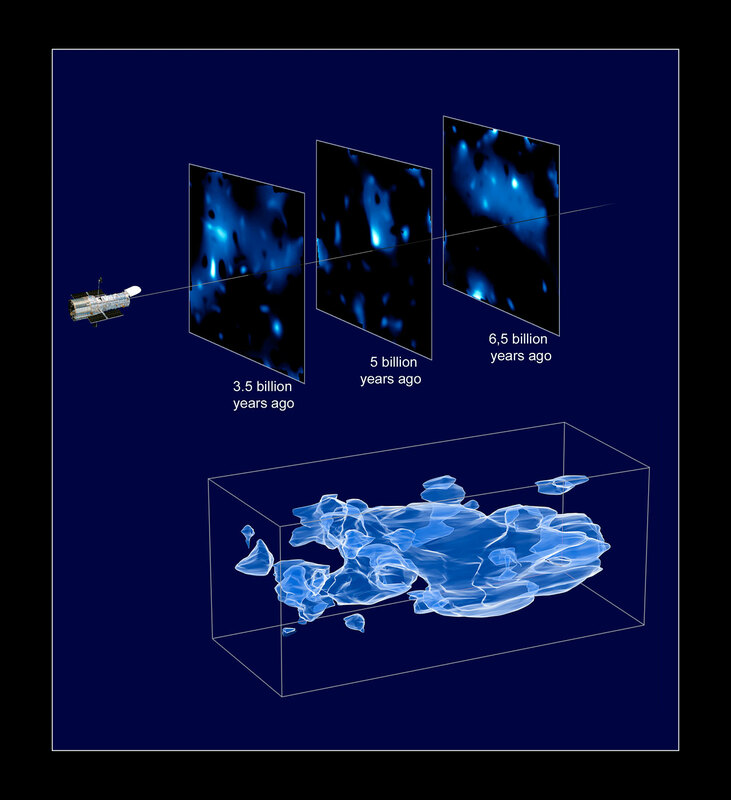 3D vision: Observations of weak gravitational lensing at various distances in the Universe enable astronomers to map the 3D distribution of dark matter. Accelerating: A mysterious property of empty space – dark energy – is accelerating the expansion of the Universe. But no-one knows its true nature. The Universe is filled with stars and galaxies. But that’s only the tip of the iceberg. There’s also dark matter and mysterious dark energy. No-one knows exactly what they are.